This graphic, which I found — where else? — on an atheist Internet community, instantly grabbed my attention because the inference is crystal clear: if you don’t use your brain, then you’ll become a person of faith. Indeed, I’ve discovered many atheist people enjoy pointing to studies that suggest the smarter you are, the less belief you have in God. One such study, reported at charismanews.com, examined the findings of other studies going back to the 1920s and reported that a majority of those studies concluded more intelligent people were less likely to have religious beliefs. But hold on here. The dude who examined all those studies, psychologist Miron Zuckerman, noted that his report does not mean only dumb people believe in God. Rather, he said, it shows only that more intelligent people may have less need for religion. Besides all that I’ve written so far, here’s what else inspired this essay: They told me to use the brain God gave me. I did. Now I’m a follower of Jesus. Ironic, isn’t it? Now, before anyone brings up arguments about age or indoctrination, let me tell you that everyone in my biological family abandoned even the social pretense of Christianity at least 30 years ago. I was with them until the age of — get this — 42. I engage in political discussions — and, like more serious Christians than our media would ever admit, I am certainly NOT a hardline right-winger. So, does any of this help you to rethink your notions about Christianity? Does it make you more open to considering what following Jesus is all about? Yes or no, post your thoughts below and let’s have a conversation. It’s not about intelligence, but wisdom. Intelligence says it’s raining, wisdom says go indoors. There are incredibly intelligent people who believe that Christ lives. Isaac Newton invented calculus, he was one of those types. Other people, such as myself, embrace the wisdom of having words mean exactly what they have always meant. Death is defined as the irreversible cessation of life. If you come back from the dead, you didn’t die. Any part of the body, including the brain, can be used for good or evil. And since the understanding that God exists is achievable through reason, it is the atheist who freely chooses not to learn how to use the reasoning function of the brain. Consequently, to be an atheist means to learn not to use the brain to its full potential. You can come to knowledge of a Trinitarian-incarnational-atoning-resurrecting-ascending-soon-to-be-returning-God who sacrificed himself to himself and all this through the wild and wacky insemination of a virgin with himself since Father and Son are one? We’re not talking about a fuzzy deist “god” or “force”….We are talking about the descriptors involved in defining the three-in-one, Yahwehjesuspigeon. I was a Christian from the time I was knee-high to a disturbing dogma. 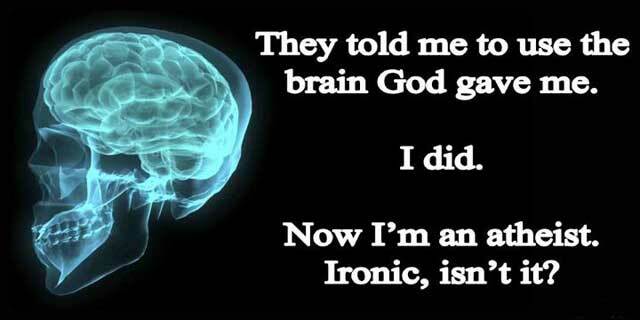 I did not become “smart” once I became atheist. My Christian relatives are not “dumb”. The only difference is that I applied the exact same standards of evidence that I already apply to other supernatural claims, to Christianity. I refused to entertain double standards when it came to the resurrection of Christ, the Salem witch trials, the apparitions of the Virgin Mary in Croatia, Mohammed’s flight to heaven, psychic healers, ghosts, etc. Once I applied the same standards of evidence and critical thinking to Christianity that I apply to Scientology, Raelianism, Islam, UFO cults, etc., it was like knocking down dominoes. I didn’t privilege Christianity nor did I shield it from scathing criticism or from meeting the thresholds of evidence that we already demand from anyone making a supernatural claim. You have used the logical fallacy of moving the goal post (changing the subject). Your argument is against religion. One need not be religious to understand that God exists. Thanks for your thoughts. No one EVER said Christians were perfect. And Frank’s Cottage is not meant for atheists. It’s written for people who are open to spirituality. Good point from your personal conversion account. I would possibly interpret the correlation between higher education and atheism as propagation (propaganda?) of a secular worldview. Criticial thinkers may not take the time to think critically about everything they’ve been taught. It applies to even the highest echelons. So, does any of this help you to rethink your notions about Christianity? Does it make you more open to considering what following Jesus is all about? But please don’t take these as “I’m a total and utter atheist”. It’s more that the answers to these are very complex for me. I have a deep and healthy respect for a good many Christians. I live in a family that is Christian, go to church every week (even teach in Sunday school), and do believe that Jesus was overall a good man with very progressive ideas and ideals, revolutionary ideas for his time and where he lived. Most of the Christians I know are very intelligent people that do a lot of good things for people in their community. My objection to the term “using one’s brain” because that it is a harsh, condescending phrase used to point out when someone is doing something that will likely severely injure themselves and/or others. In both turns of phrase, it is used to attack and bring down those who believe differently, indicating that they are of below average intelligence. People on both sides who deem those of faith (or lack of faith) as – to put it it simply – stupid is ignorant in and of itself. History speaks to the brilliance of both believers and non-believers. I reserve my disappointment for people who take everything on faith (be it from a Christian standpoint, an atheist one, or other), who never question what they are told or why they believe what they do, who do not inform themselves and insulate themselves from anything that is different or of an opposing viewpoint. Those are the people that this should be aimed at. If you have never been torn over what you believe, you have not questioned your beliefs. If you have only been torn between two beliefs and ignored that there are multiple religions in the world, then you have not questioned your beliefs enough. If your beliefs will never change and no new information might make you rethink some part of your beliefs, then you have stopped using your brain. I believe that I am human and therefore eternally a work in progress. I believe that what I believe now will likely change because I live, and therefore experience new people and ideas which are bound to have some influence. I can only see the world through my own experiences and information that has crossed my path, and after examining the world with the input that I have and that I can gather through others, I have decided that I believe in God…. But not the God that most Christians would describe or know. And currently, there has not been any thought or idea that a Christian has presented me with that has changed my mind about my belief in the Christian god. Will that always be the case? I don’t know. I can’t see the future. In the meanwhile, while I don’t agonize over it, I do keep an eye out for evidence (not for just one side or the other, but for all sides of the religion debate since I acknowledge that there is more than just Christianity in the world) that might show me otherwise. People who actually consider this question, whether or not they ultimately choose belief in Christ or something else, may very well be more intelligent. The vast majority of people I know, both inside and outside the church, beleive as they do by osmosis – assuming the faith of their families, friends, or culture. Certainly there are brilliant Christians (such as CS Lewis, GK Chesterton, or even Thomas Aquinas or St. Augustine), just as there are brilliant minds in other faiths – but those people gave their beliefs an uncommon amount of thought. Much like some people errantly believe that bravery is the absence of fear (it actually requires fear: I think it was John Wayne that said bravery is being scared to death and doing what you have to anyway), a faith is not the absence of questions, nor willful ignorance of fact…it requires mental wrestling. Muscle is not increased through peaceful rest, but by stretching and tearing it. Heart, Soul and Mind are what Christ tells us we are to devote to the Lord. I like this article very much, Frank. It is enough like my own past experiences to be of special interest to me personally.